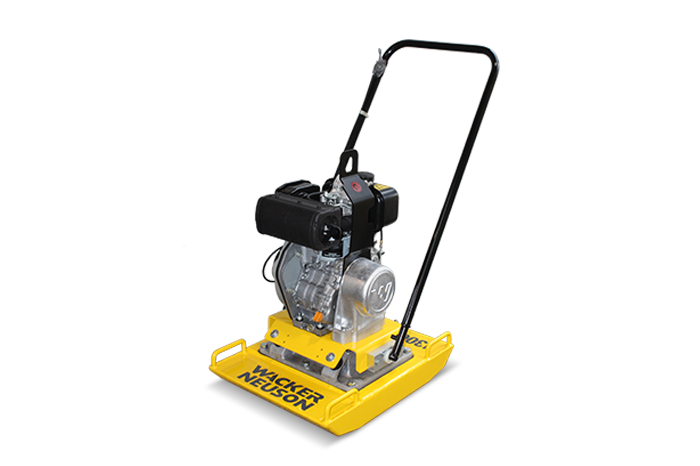 The Wacker Neuson VP70 vibrating plate is a serious machine to help you get into those tight areas to compact surfaces. The reversible handles make the machine extremely versatile and they are isolated from the vibrating plate to ensure that the operator is not easily fatigued. Ideal for surfaces such as sand, crushed rock, granular materials and segmental brick paving. The power is transmitted to the plate from the drive engine using a centrifugal clutch and V-belt directly to the exciter, which then transmits centrifugal force into the base plate evenly. The conveniently placed handles also allowing for easy loading and unloading for transportation and use. This model can come in a choice of three engines using either a Honda, Robin or Yanmar. The most notable difference is the Yanmar is a diesel vibrating plate not unleaded. All engines are super reliable and cover the same amount of advanced travel when operating. For more information or advice on which engine or vibrating plate suits your needs call us on 5331 1618.